The New Penn Avenue: Sustainable? A view of the U.S. Capitol from Pennsylvania Ave SE. Photo by fletch37. One of D.C.’s busiest corridors is getting a touchup. The Great Streets Pennsylvania Avenue initiative, kicked off a couple of weeks ago by Mayor Adrian M. Fenty, will seek to enhance the street’s physical landscape as well as its transportation use. But will it improve sustainable options for city commuters? The answer may depend on the city’s budget priorities and transportation needs. The $30 million initiative is, after all, funded by the District’s portion of the American Recovery and Reinvestment Act of 2009 (ARRA). TheCityFix reported last month that stimulus funds have the potential to promote sustainable transportation options but face obstacles including budget cuts and project delays. An expanded sidewalk network along the full length of the corridor. Three rain-gardens, a method that uses soil and plants to capture pollution from runoff. The project may rebuke the theory that sustainable transportation will suffer under the recession. In fact, the District’s actions may point to another trend: that green design is the favored method for renovating and developing infrastructure in today’s economy. TheCityFix reported recently on the spike in sustainable practices on U.S. college campuses despite a drop in endowment funds. Capital investment in green transportation technology also increased in 2009, a trend fueled by government support for green projects and because of the failing car industry. 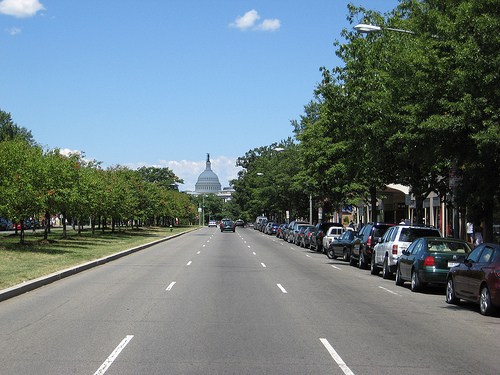 The Pennsylvania Ave. project itself is part of D.C.’s Great Streets Initiative, a comprehensive program that seeks to renovate six major corridors through local business development, public space improvement and the reduction of heavy vehicle traffic. Promoting pedestrian and mass transit options is one of the major goals of the initiative. The project also follows a growing list of mass transit projects enacted (or waiting to be enacted) under the Fenty administration. Construction began recently on a 1.5 mile streetcar line in Anacostia, a mass transit option expected to open by fall 2012. Plans are also underway for a new stimulus-funded K Street layout that will feature bus-only lanes. ARRA funds will also go to the city’s Smartbike program, an initiative that will install 40 Smartbike stations and 480 Smartbikes across the city. A full list of D.C.’s ARRA projects can be seen here. It’s worth noting that the city received a total of $123.5M in stimulus dollars for transportation related projects, but more than $80 million of this total package must go to state highway funds. Regardless, D.C. officials seem to be making an effort to add in as many sustainable amenities as possible into renovation projects. Thus, we’re learning more about how stimulus funds can be used for sustainable transportation projects. D.C. is one urban region that is taking the opportunity to enact mass transit and pedestrian-friendly solutions, even in areas not often frequented by tourists (i.e. SE Pennsylvania Ave). Ultimately, the nation’s capital may become a model for effective urban sustainability and inspire other cities to do the same. Tags: ARRA, commuters, pedestrian, Pennsylvania, renovations, stimulus, sustainable, Washington, D.C.